So, Manchester United will start 2016 without a win in eight league and cup games. Will they be starting it with a new manager at the helm? Thanks for your company. We're back on Tuesday to see if Leicester City can return to the top of the Premier League table by beating Manchester City. Don't forget you can catch up on all of today's action on Match of the Day which is on BBC One at 22:30 GMT. "United's vibrant start, out of character with the timidity of recent weeks, instantly lifted the spirits and the fans remained solidly behind their team throughout. The final whistle was greeted with some jeers but this was more out of frustration that United could not find a winner." Manchester United manager Louis van Gaal speaking to BT Sport: "It was a very good performance but you have to score - we didn't. Two times we hit the post with goalkeeper beaten. We also have big chance in the second half, two penalty cases and didn't receive penalties. We are forcing the luck but we don't have the luck that we need." Chelsea interim boss Guus Hiddink says in his news conference: "The players have experienced a very bad half year. They have to lift it up and that's what we have talked about in the locker room. Everyone is convinced we couldn't go on on the same path and we have shown that in the last three games." Manchester United manager Louis van Gaal speaking to BBC Sport: "We have forced the luck and still we didn't score and that is unbelievable when you see what happens today. I am frustrated. "I thank my players for the performance but we need a victory. It gives a lot of hope for the fans. My relationship with players, board and staff members is very good. There is no reason to sack me. "The results are not good enough. I know that, the players and board know that. It can be different in about one month." Manchester United midfielder Morgan Schneiderlin:"I thought we were unlucky. Everyone in the changing room is disappointed we did not win. We dominated the game and had a good tempo - we were on the front foot from kick-off and showed commitment. "We wanted to show the fans we wanted to win but it is the same story again - in football you can't win if you don't score." Chelsea manager Guus Hiddink, speaking to BBC Sport: “On the one hand, I am happy with a point because we had a difficult game, but on the other, we had two big chances to get three points. We were lacking some attacking players and had to adapt. In general, I’m happy. “Hazard is very mobile and can go either way. His preference is the left and he’s doing very well in the centre. All our strikers are injured, so we have to adapt." Next up for Chelsea is fifth-placed Crystal Palace away on 3 January. The champions start 2016 three points above the relegation zone and 14th in the Premier League table. Manchester United manager Louis van Gaal, speaking to BT Sport: “For me, it [his future] is not an interesting subject because I cannot have any influence on that, I can only work with my players and you can see they are fighting for me. Even after this result the fans were applauding so I cannot say I’m very much concerned. In this football world you never know, but I’m fully confident in the board and my players. "Will I resign? On the contrary. When the players can give such a performance with a lot of pressure, there is not any reason to resign for me. Maybe the media wants me to but I shall not resign. It's not a question of staying, it's a question of fulfilling my contract." Wayne Rooney says he has apologised to Oscar for his high challenge towards the end of the game. The United captain escaped with a booking. Louis van Gaal tells BT Sport he is not going to resign. More from the Manchester United manager coming up. Chelsea goalkeeper Thibaut Courtois, speaking to BT Sport: “They wanted to win in front of their fans. From the start they put high pressure on us. Without a striker, it wasn’t easy for us to find depth but we had chances and David [de Gea] played well. The team showed progression, which was good. “It’s a pity Matic doesn’t score. It’s more difficult for us than last year, but I think we are getting into a flow to win games. United had 67% possession to Chelsea's 33% yet they end 2015 without a win in eight league and cup games. They will start 2016 out of the Champions League, League Cup and nine points behind new Premier League leaders Arsenal. Manchester United goalkeeper David de Gea speaking to BT Sport: "Both teams had chances but I think we played better than them. We didn't have the luck we need to win these games. "We have to keep focused on only football and try to win the games ahead." Manchester United striker Wayne Rooney speaking to BT Sport: "We created a lot of chances but didn't manage to take one. The crowd were excellent today and you could see how much it meant to the players. It's a disappointing result because we dominated the game but that is football. "A lot of people say a lot of different things. We would be letting ourselves down if we didn't go out on the pitch and give our all. We will keep fighting and we will come back." One goal in Manchester United's last four home games now. "I'm not sure where Manchester United go from here but this is the best I have seen them play for some time. They ran out of legs second half but they were totally committed to the cause. Chelsea looked short on confidence and missed a recognised striker up top." Chelsea's players are only just leaving the pitch. They've all gone over to applaud their travelling fans. It's a decent point for Guus Hiddink but he's still searching for his first win since being named interim boss. There's a few boos and jeers at the final whistle. It's not clear if they are coming from the home fans but there's an awful lot of applause too. Despite that awful challenge, Steve McManaman has just given man of the match to Wayne Rooney on BT Sport. Naughty by Wayne Rooney. A horrible challenge on Oscar and it should be a straight red card. Instead Martin Atkinson brandishes a yellow. "Great football - and what a delivery from Borthwick-Jackson. Great pace on it but Rooney can't get his foot up early enough. It was just too high for him." "Attack, attack, attack," is the roar inside Old Trafford. It's a familiar chant but this time it's coming from those cheeky Chelsea fans. Huge chance for Wayne Rooney...and he's put it wide! A delicious cross by the young lad Cameron Borthwick-Jackson but Rooney misses. United's fans have been starved of entertainment this season but this has been a cracker even though we have not seen any goals...yet. "United's players have put a terrific shift in but now they look like they are feeling the pace. They've played some risky football which is not what you expect to see. You cannot say this team haven't played for Van Gaal today. They've given everything." Frustration from the crowd as a United attack breaks down just outside the Chelsea box. Seven minutes for United to find a goal...otherwise it is eight games without a win. United's third and final change...Phil Jones for Daley Blind. Fifth booking of the game...Bastian Schweinsteiger brings down Nemanja Matic. Ten minutes of normal time left. A huge roar goes up from the home fans. They're urging their side forward. United are bossing possession. They're pinging the ball around outside Chelsea's penalty area but they can't create an opening. Chelsea's defence is standing firm. Another United change. Juan Mata is replaced by the fresh legs of Memphis Depay. Frustration creeping in at Old Trafford. Thirteen minutes of normal time remaining to get a goal. Are United going to score? They have done everything but. Fifteen minutes left. If Man U are really title contenders they need to be putting away these poor lower half teams. Air kick from Wayne Rooney inside the Chelsea box with only the keeper to beat. It wouldn't have counted. He's offside. Eden Hazard, who has been kicked black and blue, shows his frustration as he fouls Ashley Young and is booked. Chelsea are first to make a change. Ramires replaces Willian before United react by sending on young defender Cameron Borthwick-Jackson for Matteo Darmian. I feel sorry for the sponsors who have to name a man of the match. Courtois? De Gea? Martial? Hazard? It definitely won't be Matic after that miss. Just over 20 minutes remaining. This could go either way. Bore draw this is not. Stand by for a grandstand finish. "For all Manchester United's pressure, there has not been a clearer opportunity than that one Nemanja Matic just had. He never gave off any air of confidence that he would score - and what a blow it would have been to United after their dominance. Right in the balance now." "That's a terrible finish from Matic. What a chance! But you have to question United's set up to have allowed him to be sent clean through like that." No goals but incidents galore. Shortly after Ander Herrera had been denied earlier Willian appeared to handle the ball while attempting a clearance. No penalty awarded. What a miss! Chelsea catch United on the counter and Nemanja Matic is clean through with only David de Gea to beat, but he can't keep his composure and sends the ball high over the bar - a match-winning chance missed. They have hit the woodwork twice and they have been denied by the brilliance of Thibaut Courtois. What on earth do United need to do to put the ball in the net? "It's impossible how that has not gone in! I thought that was 1-0. Somehow the ball goes past the far post! It's a great reaction save but Herrera really should score." How on earth did that stay out? United fans think they have scored after Ander Herrera connects with Anthony Martial's pass in the six-yard area, but Thibaut Courtois makes an outstanding point-blank stop in front of the Stretford End. Astonishing. "Hazard needs more protection. Man Utd have played the dirtiest half I've seen for a long time." Eden Hazard is such a threat for Chelsea. He's been fouled so many times but it was his pass which set up Pedro earlier. Chelsea have started this half very well. They spent the first 45 minutes on the back foot but are going for it. Not one outstanding save but two from David de Gea as Chelsea come firing out of the blocks. The United keeper is at his best to parry Pedro's effort from inside the area before keeping out Cesar Azpilicueta's follow up. "That first half was what you expect from a United side at Old Trafford. The only thing that has let them down is the final third. They don't have a presence in the box." For all their good play in the first half, United need a goal. We're back under way. Chelsea are up to 14th in the 'as it stands' table - three points above the relegation zone. United remain sixth - nine points behind Arsenal who lead Bournemouth 1-0 and are currently top. "Manchester United were excellent for the first 30 minutes. They were playing how you would expect a United team to play. Chelsea were caught cold. But if they can tighten their game up on the counter attack they can still get a positive result." That is one of the best goalless 45 minutes I have seen for a long while. United have come with an all-out attacking approach and have twice been denied by the woodwork after David de Gea produced a world-class save to deny John Terry. But United fans, who applaud the team off the pitch, will not be totally happy until they have the lead. "The life has gone out of this game in the last 10 minutes before half-time. Manchester United have just lost a little of the momentum they had while Eden Hazard has just started to show off one or two of his party pieces. Lack of goal apart, Manchester United manager Louis van Gaal will be pretty satisfied with that." "Martial is still United's best outlet in this game. He definitely has the beating of Ivanovic." I've lost count of how many times Eden Hazard has been fouled. He lets out a yelp after being challenged by Juan Mata. Bastian Schweinsteiger lets fly from outside the area. Hmm..the less said about it the better. United fans are happy. How do I know? They're singing Christmas carols. Is this going to finish 11 v 11? The first half has been littered with a string of meaty fouls. Chris Smalling is next into the book as Eden Hazard is once again brought down. United are ahead of Chelsea in every stat - except the one that counts. Goals have been hard to come by for Louis van Gaal's side and United fans won't relax until their side is ahead. "That should be a yellow card for Herrera, he had no intention of tackling or winning the ball. Hazard has gone past him and he has just swung at him. I'm sorry, you can't do that." I can't think of anyone more opposed to the spirit and identity of United than Mourinho. He truly would destroy the club, not just the team. A break in play while Willian is treated following a tackle that earned Morgan Schneiderlin a booking - and Chelsea boss Guus Hiddink took the chance to get down to the technical area and give some advice to his players. Chelsea have been comfortably second best so far today. This is a vibrant Manchester United in the first half hour. Apart from John Terry's early header which brought a fine save from David de Gea, Chelsea have hardly troubled United. But the champions get a free kick - and some much needed respite - when Eden Hazard is hacked down by Ander Herrera just outside the United half. It comes to nothing. Terrific long-range effort by Wayne Rooney and an even more impressive save by Thibaut Courtois. Goalless but this is a belter. Anthony Martial is a joy to watch tonight. He's running at top speed at Chelsea's defence as he's sent tumbling by John Mikel Obi. A yellow card for the man in blue. Where has this United side been hiding? They're playing enterprising, attacking football and have done everything but score. "That's the problem when you play such a high tempo, normally around the 30-minute mark you do start to tail off. United need to capitalise on this dominance." Anthony Martial goes down inside Chelsea's penalty area after running into the blue brick wall that is Kurt Zouma. Around 72,000 United fans scream for a penalty. Martin Atkinson says no. Adnan Januzaj, farmed out on loan to Borussia Dortmund by Louis van Gaal, is watching from Old Trafford's directors' box as Manchester United make a very bright start here. Only the woodwork has denied them and they are playing the sort of high-tempo attacking football their fans demand. United are playing with a real sense of purpose and desire - ingredients which have been missing for so many of their games this season. "It's a different United we are witnessing, quicker and with more purpose. It's the sort of thing the fans at Old Trafford want to be seeing.This is more like the Manchester United of old." United hit the woodwork AGAIN! Anthony Martial is a box of tricks on the edge of the Chelsea penalty area, before cutting inside and firing past Thibaut Courtois, but the ball rebounds off the post. How much longer will Chelsea hold out? "The tempo they are playing at, I don't know how long Manchester United will keep it up for. They are all over Chelsea at the moment. Now they need to make it count." The game has settled after such a lively start. Oscar gives away possession inside his own half but the hosts can't capitalise. Ashley Young, at right-back, and Matteo Darmian, on the left, are causing the visitors problems on the overlap. United have done more in the opening 10 minutes here than they did in 90 at the Britannia Stadium on Saturday. Old Trafford may have been subdued before kick-off but it has come to life in these early minutes after a bright and energetic start from Manchester United. Chelsea are not standing back and it took that superb save from United keeper David de Gea to deny John Terry. First on Match Of The Day tonight, Gary? Another United chance and Morgan Schneiderlin fires a shot narrowly wide with a first-time effort from outside the area. United are up for this. It's a complete contrast to their start at Stoke on Boxing Day. Chelsea, all in blue, are attacking the Stretford End. More television replays of David de Gea's save to deny John Terry. It gets better and better. This is already turning into a Christmas cracker. Both teams might be struggling but both could already have early goals. It's frantic end to end stuff. "If you look at Chelsea, they have set up for the counter attack. They will think if they can get the the lead they will be good enough to hold on to that." Brilliant save by David de Gea to keep out John Terry's header from a corner. The United keeper shows stunning reflexes to stick out a hand and push the ball over. What a start to this game. Juan Mata might have been denied by the bar but that effort has got the crowd going. "Van Gaal's made a few changes, Darmian coming back is a plus - even if he is playing on his weaker flank - and there's a better balance to the sides. He has a lot of experience out there. He is hoping the senior players can drag the younger players through." Huge roar as John Terry concedes an early throw-in. Seconds later Juan Mata hits the crossbar with a thumping effort after a great pass from Wayne Rooney. Just the start Louis van Gaal wanted. Louis van Gaal marches down the touchline returning the applause he receives from many Manchester United fans. Will what he writes on that trademark clipboard today amount to a resignation note? Off we go. A huge 90 minutes ahead for Louis van Gaal and Manchester United. Louis van Gaal might be under pressure but he gets a decent reception from the United fans as he makes his way along the touchline to the bench. He waves to fans and they respond with applause. However, there are several anti-Van Gaal banners in the crowd. "This was the game that has defined Premier League seasons in the recent past - today it might define Louis van Gaal's future as Manchester United manager. Chelsea are in limbo under temporary manager Guus Hiddink (again) while his fellow countryman Van Gaal desperately needs a win. The Old Trafford DJ is doing his best to rev things up but at the moment the atmosphere reflects the mood of these two teams and sets of supporters - low-key and subdued." These Jose Mourinho Manchester United scarfs on sale outside Old Trafford have caused a stir. Some United fans have taken to social media to brand them a disgrace. What do you think? Tongue-in-cheek or out of order? Chelsea started the day 15th in the table but have dropped to 16th - two points above the relegation zone - following the 15:00 GMT games. United are sixth in the table - nine points behind leaders Leicester City. Gary does have a point. Scholes is looking a little grizzly in the BT Sport studio. Chelsea do not have a recognised striker in their side. Diego Costa is suspended, Loic Remy is injured so Eden Hazard is expected to lead the forward line. Kurt Zouma replaces Gary Cahill, who has a foot injury and in the other change from Boxing Day, John Mikel Obi will play alongside Nemanja Matic in midfield having come on at half-time for Cesc Fabregas against Watford. Fabregas is not involved because of illness. Forward Wayne Rooney returns as captain, in one of four changes made to United's starting line-up by Louis van Gaal. Also back is defender Matteo Darmian and midfielders Bastian Schweinsteiger and Morgan Schneiderlin, with Michael Carrick, Phil Jones, Marouane Fellaini and Memphis Depay dropping to the bench. Former United players Paul Scholes and Rio Ferdinand are in the BT Sport studio at Old Trafford. Neither think Louis van Gaal should be sacked if United lose today. "Performances throughout the season have not been good enough," says Scholes. "I think he should be given the chance to turn it around." Will Chelsea's interim boss Guus Hiddink get his revenge? Half an hour to kick-off and Sir Alex Ferguson is here. The former United boss turned up nice and early in a chauffeur-driven car and even managed a smile and a wave to the waiting cameras. Not sure Louis van Gaal is feeling so chirpy. In his programme notes for tonight's meeting with Chelsea at OId Trafford, embattled Manchester United manager Louis van Gaal is in defiant mood. He writes: "We can turn this situation around. This is Manchester United, a club which is known around the world for never being beaten and I have confidence in the players, the staff and myself that we can do this and begin to once again reward you all." Will that be the speech after the game? "In most other years this would be THE game of the Christmas and New Year schedule, but whilst still being a must-see, it might belong better in the Radio Times' drama listings. "'Dutch Masters', 'Clash of the (failing) Titans' or 'Louis' Last Stand?' Give it any title you want and see the ratings soar. "After his 'second debut' draw against Watford, Guus Hiddink said he hopes his side 'show the same ambition' at Old Trafford. 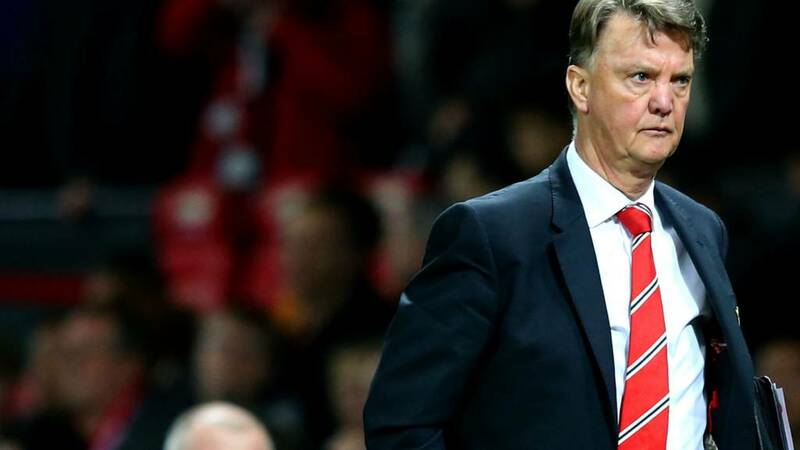 "For his own sake, it's to be hoped that Louis van Gaal feels the same way. "At Stoke he said United's players 'didn't dare to play our football'. He's got to double-dare them now." As always, thousands of fans arrived early to greet Manchester United's team coach outside Old Trafford. Biggest cheer by far was reserved for Wayne Rooney while Louis van Gaal, dressed in a smart suit and club tie, did not hang around as he quickly made his way to the dressing room. "He's everywhere - but is Jose Mourinho lurking on Manchester United manager Louis van Gaal's shoulder? Seems these merchandise sellers outside Old Trafford have already decided who will soon be at The Theatre Of Dreams. Louis van Gaal's fate hangs on the outcome of today's game, according to the Guardian. The report claims that defeat at Old Trafford is likely to bring the Dutchman's reign to an early end. Monday's back pages do not make good reading for Louis van Gaal. The Daily Mirror says he does not know if he can motivate them out of their slump while Jose Mourinho has been offered the Real Madrid job while he waits for United. Rooney back to rescue LVG? Having tried and lost without Wayne Rooney at Stoke City, Manchester United manager Louis van Gaal restores his captain to the starting line-up against Chelsea. Like his team-mates, Rooney has looked short on spark and inspiration this season. Van Gaal needs him to rediscover it today. Captain Wayne Rooney returns to Manchester United's starting line-up. Jose Mourinho gone. Louis van Gaal on the ropes. Chelsea battling relegation. Manchester United no wins in seven. When the fixture computer churned out this Christmas cracker back in June no-one could have predicted the above. Yet Van Gaal, 19 months into a three-year contract, finds his position under serious threat after a terrible run. Mourinho's availability following his Chelsea exit has done nothing to ease the speculation that there could be a managerial change at Old Trafford around the corner. "This club has big ambitions. I too have big ambitions. Together we will make history," boasted Louis van Gaal when he breezed into Old Trafford on 19 May 2014. Unfortunately for LVG it is the wrong kind of history that is threatening his 588-day reign as Manchester United boss. The Dutchman has overseen a run in which United have lost four matches in a row during a single season for the first time since 1961. Will United's final game of a trophy-less 2015 be Van Gaal's last in charge? Welcome to our live page for Manchester United v Chelsea. We’ll have Radio 5 live and live text commentary here from 17:00 GMT. You can keep up to date with all the build-up and latest from today’s other games here.